"How To" books and sites are great fun to read, even if you never actually do the thing. 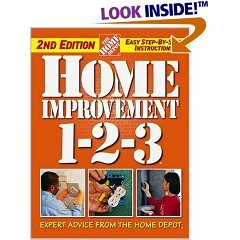 I have been perusing Home Depot's Home Improvement 1-2-3 with great enjoyment and edification. Since I do not ever plan to retire, I don't know when I will find the time to try most of�these things, but it's fun to know how they are done. And speaking of "How-To" books, one would have to place the Kama Sutra on top, as it were. It was written by the Hindu sage Vatsyayana between the 2nd and 4th centuries, for prosperous male�urbanites, not for the masses. It was meant for spiritual connoisseurs, you might say. Here's a good Kama Sutra ("Writings on Love")�site.�Study it carefully, boys and girls - and practice, practice, practice.�Pop quiz later�this week. Image: Charunarikshita - "lovely lady in control." I thought "Charunarikshita" meant "Hurry up i'm getting a charley horse". RE: Expert advice from Home Depot..
WE HAVEN'T ALL SUFFOCATED FROM THE PILES OF GARBAGE THAT ARE A FOOT DEEP THROUGHOUT THE ENTIRE HOUSE! IT WOULD TAKE AN ARMY TO CLEAN THIS PLACE! AND DON'T EVEN GET ME STARTED ON WHO CHANGES THE TOILET PAPER ROLL! yow--that oughtta get the troops lined back up in a hurry! That's a good one, Patina. Am not menopausal yet, but have been known to say the wrong things or go off the handle from time to time. Pretty dumb of me, and certainly not nice. Only mention this because I'm pretty sure I acted a bit offensively to Buddy here a while back, not aware of some of my stupidity, but I did knowingly say rude, impolitic and unjustified things on occasion, and he's the last man on earth to deserve such treatment. Am very sorry for that, Buddy-- I just didn't know how wrong I was being. Have always admired you and your friends for your politics and expression. Re home improvement- most don't need it, better to spend one's precious time and limted funds on learning, producing and trying to be a positive in this reality. Domicile as a fancy structure is like the heart as a sweater over it. Just my two cents. I would specify all of the wrong things I said and did, but am not completely sure. Still, I KNOW I mentioned some things I should not have, no matter as a reaction to things said by others, and I certainly shouldn't have tried competing with another woman, someone's very special lady. Haven't been in shape for a while, getting there now, but also she had his heart and it was wrong on my part to throw myself into the mix. And on occasion I was rude to her, mostly in reaction, but still, no excuse. Sorry to the two of you. Then I mentioned family money on the wrong hunch, when I should have been honest and told the rest of the story- most of it was lost by injudicious investing, etc. Can't think of what else, but my politics and personal philosophy are fairly consistent-- perhaps they should be more expansive and I could learn a broader perspective from the thinkers here. At any rate (preferably a 20% return), we all make mistakes and aren't always what and who we seem. But I feel particularly bad if some feel as if I misrepresented myself or for having insulted people, especially the enlightened types at MF. No BS- y'all pretty interesting, you know. Oh, mercy--some blunders i and nearly everyone i know have pulled--don't let it get ya down. As they say, it ain't the getting knocked down that's important, it's the getting back up that really counts. Corny but so true. Funniest, best-written how-to book ever, also on a topic I have no illusions of mastering or even applying myself to with any diligence: Miss Manners' 1983 Guide to Excruciatingly Correct Behavior. Judith Martin's simply one of the better writers working today in any genre. Char - get over it! Club - agree. Amusing book. Have to agree, Club. My mother made me memorize before I started Cotillion. So you know the proper way to eat a potato chip, as she writes in answer to the question -- with a knife and fork, "an oyster knife and a pickle fork. For pity's sake, what is the world coming to? Miss Manners doesn't mind explaining the finer points of etiquette but figures anybody who doesn't have the sense to pick a potato chip out of a bag and stuff it in his mouth probably shouldn't be running around loose on the streets." And I love the how to eat watermelon one, divided into "Formal -- fleck seeds out with a knife" down to "Highly informal -- Put face in watermelon and see how far you can spit the seeds." don't forget another along that line, L. Rust Hill's "How To Eat An Ice Cream Cone". Speaking of which, my baby sis borrowed my copy 15 years ago--wonder if she's about done with it? Depends -- does she know which fork to use yet?